On Thursday, the Class A Lakewood BlueClaws will host the South Atlantic League Championship Series for the first time in six years. With the series tied at one game apiece, the 'Claws are slated to host the remainder of the best-of-five title round with games three, four and five (if necessary) being played on successive nights. 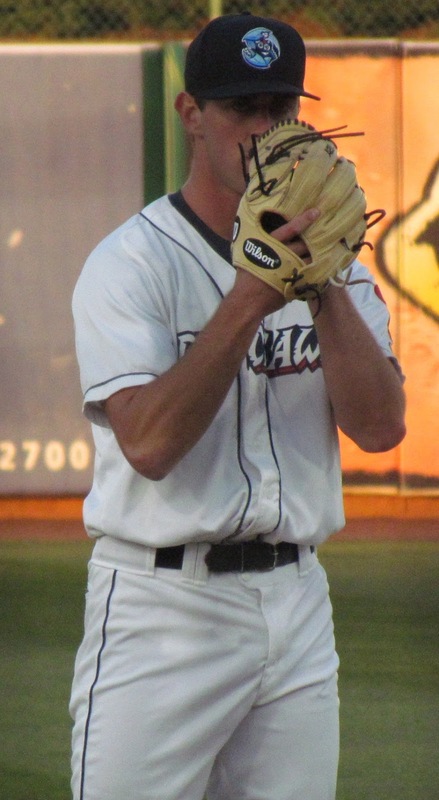 Prior to the championship series, I spoke with BlueClaws starting pitcher Tyler Gilbert, who posted a 7-9 record with a 3.98 ERA in 23 starts this season. The 22-year-old left-hander chatted about his development this year, the team bonding over rap music and plenty more. Read ahead for that full interview. -What are your thoughts on your 2016 season? -Is a lot of that coming from Sweeney or are you working with the battery mates on that? Sweeney has helped me a ton. He's been seeing what I need to work on and he's been helping me a lot. I guess, just he's told me it comes with experience, and just learning how to call your own games. A lot of the pitchers in college, our coaches they call our game. It's been a fun year. I've learned a lot and I'm trying to get better and trying to come into next year even stronger and more disciplined on the mound and just a whole lot better. -Are there any teammates that you've picked up something from that has helped you this year? I try and look at, let's say when Jeff Singer was here I was trying to look at his mechanics because he's Jurassically improved his velocity since last year and so he's doing some things right and I am trying to mimic his mechanics a little bit. And just here and there trying to pick up on people's mechanics, trying to see if I can utilize if for myself and have it help me. But I try to study everybody and see what's different, you know? -You've talked about improvements you've made. And then mentioned Singer's strides. Aside from the pitch calling, would you say there are any Jurassic improvements in any part of your game? Yes, I would definitely say so. I'm starting to learn how to use my legs. It's something that I kind of never really put a lot of effort into because I just-- I don't know, in college I didn't really put a lot of effort into it, but now I'm getting to use my legs a lot more. And that's something that's cool because I can feel myself having more power to the plate and just working into this off-season I am going to try to get my legs a lot stronger, so it just benefits me more for this upcoming spring training. -How is the team feeling as you guys strive toward winning a championship? The chemistry's great. The second half it's been good chemistry. We actually put together a couple songs with the Latins and the Americans. So, just little things like that is cool. The chemistry is really good right now and everybody's just in it to win it right now. -So I imagine the song writing is for fun and bonding? Yes. It's all for bonding and for team chemistry. Like, I'll make a beat for some people and some guys will rap and we'll mix in Latinos and it's just a cool experience. On the road, we'll do it in a hotel room and it brings the Latinos and Americans together sometimes. And we've been doing that a lot recently, so the chemistry has been really good. There is. We actually recorded two hits. -When will, or can, the public get a sample of these? I don't know if we're going to debut them. I don't know if the public's ready for the heat. But, we might consider debuting it soon. I am not sure. Maybe if we win the whole thing, we'll debut it. But, there's a lot of talent in those songs. I mean, I don't know, we'll see. -Here's what we may need to do, not to jinx or get ahead of ourselves, provided there's something big won by this group, what about making the championship merchandise flame resistant, to help the fans get ready for when you guys spit that hot fire? I agree. You couldn't have said it more perfect right there. So, we'll consider debuting it, but I just don't know if the public's ready. -Okay. You guys keep warming things up on the field and you'll get everybody ready. We kind of bypassed it earlier, your battery mates...I always do get good feedback on Deivi Grullon being great out there and you've got other guys you have paired up with this year. Can you share some thoughts on those guys and how they can help you? It's another part of a learning experience for me, trying to be 100-percent comfortable with each catcher that we have. And this whole year, I've been trying to get on the same page as all of them. You know, and sometimes you have better outings with certain catchers and sometimes it's the other way around. Bottom line is just trying to link up with the catcher you have that day and trying to make sure you're on the same page. Having that rhythm out there with a catcher is important, but I mean it's just a learning experience. You're never going to get who you want every time, but you've gotta just be comfortable with anyone and just learn how to have that rhythm with any catcher. -While you were answering that question, I apologize, I am still blown away by the details you shared about the music hotness. So, I have to know, because you mentioned that you have the beat on lock, who has the lyrics on lock? Okay, so check it out...we recorded two songs already and we have Jake Waguespack- he's a big time rapper. We got Sutter McLoughlin, he's on one of the songs, and then we got William Cuicas, we got a Latino on there, he's rapping in Spanish, so that's the whole mix. And then Grant Dyer's on there, um, I can't think off the top of my head, but there's a few other guys who are writing those good lyrics. It's just a good team bonding thing. You know, so it's fun. -As a side note, reliever Ulises Joaquin, who is up a level, spits those hot Espanol raps all the time. He does! And that's something that, maybe next spring training, I'm going to try to get him on a track. I've heard him in the clubhouse and it's no joke! It's some serious stuff!